The American Veterans (AMVETS), Post 14 Portsmouth, Virginia is a non-profit, accredited Veterans service organization devoted to caring for and empowering all American and Allied and their families. The Department has 13 Post throughout the state. The Department is in the Second District which consist of the following states: Virginia, North Carolina, Maryland, DC, West Virginia, Pennsylvania and Delaware . The purpose for which the corporation is organized is to engage in any activity permitted under the law of the United State (in which a non-profit corporation of this type is permitted to engage) and specifically: to promote the social welfare of the community; to assist disabled and needy war veterans and members of the U. S. Armed Forces; and their dependents and the widows and orphans of deceased veterans; to provide entertainment, care and assistance to hospitalized veterans or members of the U.S. Armed Forces; to carry on program to perpetuate the memory of members of the Armed Forces. We also provide insurance benefits and social and recreational activities. AMVETS MISSION STATEMENT: To enhance and safe­guard the enti­tle­ments for all Amer­i­can Vet­er­ans who have served hon­or­ably and to improve the qual­ity of life for them, their fam­i­lies, and the com­mu­ni­ties where they live through lead­er­ship, advo­cacy and services. Our goals are to develop partnership with cities and state governments, local communities and Veterans Hospital to enhance support for all Veterans. We Educate our Veteran and their families on the following items: Homeless Veterans, Veterans Benefits, Health Care, Food Bank, Claim Filling, and Records Management. Our Vision is that we strives to maintain, improve, preserve and defend the quality of life for all Veterans, Combat and Non-Combat and their families. As one of America’s vet­er­ans ser­vice orga­ni­za­tions, Amer­i­can Vet­er­ans (Amvets) has a proud his­tory of assist­ing vet­er­ans and spon­sor­ing numer­ous pro­grams that serve our coun­try and its cit­i­zens. 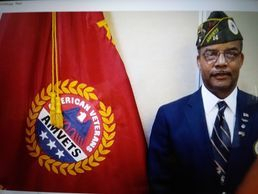 The help­ing hand that AMVETS extends to vet­er­ans and their fam­i­lies takes many forms. One of the most vis­i­ble is our net­work of trained national ser­vice offi­cers (NSOs) accred­ited by the Depart­ment of Vet­er­ans Affairs. Funded by the AMVETS National Ser­vice Foun­da­tion, these ded­i­cated men and women can be found in close to 50 states, pro­vid­ing sound advice and prompt action on com­pen­sa­tion claims at no charge to the veteran. In one recent year alone, AMVETS national ser­vice offi­cers processed more than 24,000 claims that resulted in vet­er­ans receiv­ing some $400 mil­lion in com­pen­sa­tion. This com­mit­ment to ser­vice traces its roots back to 1948, when our NSOs first began help­ing vet­er­ans of World War II to obtain the ben­e­fits promised them by the fed­eral government. Coin­ci­den­tally, it was these return­ing vet­er­ans who pro­vided the impe­tus for form­ing AMVETS in the first place. At the time, many of them belonged to vet­er­ans clubs on col­lege cam­puses. As the num­ber of returnees swelled into the mil­lions, it was evi­dent that some sort of nation­ally orga­nized assis­tance for them would be needed. The older estab­lished national groups wouldn’t do; the lead­ers of this new gen­er­a­tion of vet­er­ans wanted their own organization. With that in mind, eigh­teen of them, rep­re­sent­ing nine vet­er­ans clubs, met in Kansas City, Mo., and founded The Amer­i­can Vet­er­ans of World War II on Dec. 10, 1944. Less than three years later, on July 23, 1947, Pres­i­dent Harry S. Tru­man signed Pub­lic Law 216, mak­ing AMVETS the first World War II orga­ni­za­tion to be char­tered by Congress. Since then, the orig­i­nal char­ter has been amended sev­eral times to admit as mem­bers those who served in dif­fer­ent eras. Today, mem­ber­ship in AMVETS is open to any­one who is cur­rently serv­ing, or who has hon­or­ably served, in the U.S. Armed Forces from World War II to the present, to include the National Guard and Reserves. As a volunteer-led orga­ni­za­tion, we annu­ally elect and/or appoint offi­cers at the national, dis­trict, depart­ment and post lev­els. Each August, rep­re­sen­ta­tives from these lev­els attend the AMVETS national con­ven­tion to make deci­sions on issues affect­ing vet­er­ans and the organization. Over the years, AMVETS has been in the fore­front of public-policy related to national defense, ser­vices for home­less vet­er­ans, ade­quate fund­ing for the Depart­ment of Vet­er­ans Affairs, con­cur­rent receipt of retire­ment pay and dis­abil­ity com­pen­sa­tion by dis­abled mil­i­tary retirees, vet­er­ans employ­ment and train­ing, POW/MIA account­abil­ity and flag protection. In addi­tion to the work of our national ser­vice offi­cers, other AMVETS mem­bers, as well as those in the AMVETS Ladies Aux­il­iary, will devote as many as 250,000 hours of free time a year to brighten the lives of hos­pi­tal­ized vet­er­ans. Here, some­thing as sim­ple as play­ing cards with the lonely or watch­ing tele­vi­sion with the dis­abled can make a world of difference. So can the assis­tance we give those who want to fin­ish their edu­ca­tion. Each year AMVETS awards schol­ar­ships total­ing $40,000 to deserv­ing high school seniors, ROTC stu­dents and vet­er­ans pur­su­ing higher education. But help­ing oth­ers is not lim­ited to our fel­low vet­er­ans. AMVETS mem­bers in more than 1,400 posts nation­wide also pro­mote and sup­port “qual­ity of life” community-service pro­grams rang­ing from Spe­cial Olympics and ROTC to scout­ing and organ-donor projects. Apart from these ini­tia­tives, the orga­ni­za­tion has thrown its mon­e­tary sup­port behind work on such national mon­u­ments as the USS. Ari­zona, the Statue of Lib­erty and the Viet­nam Vet­er­ans Memo­r­ial. It also spon­sors its own car­il­lon pro­gram to honor America’s deceased ser­vice­men and women. Since 1949, when Pres­i­dent Tru­man ded­i­cated the first car­il­lon at Arling­ton National Ceme­tery, this pro­gram has grown to encom­pass more than 60 sites in the United States and overseas. As the orga­ni­za­tion moves fur­ther into the 21st cen­tury, it does so with the con­vic­tion that its focus on pre­serv­ing free­dom, sup­port­ing America’s defend­ers and serv­ing her com­mu­ni­ties remains a clear blue­print for con­tin­ued ser­vice to God and country. WE, THE AMERICAN VETERANS WHO HAVE SERVED OR ARE SERVING IN THE ARMED FORCES OF THE UNITED STATES DURING AND SINCE WORLD WAR II, FULLY REALIZING OUR RESPONSIBILITY TO OUR COMMUNITY, TO OUR STATE, AND NATION, ASSOCIATE OURSELVES FOR THE FOLLOWING PURPOSE. TO UPHOLD AND DEFEND THE CONSTITUTION OF THE UNITED STATES; TO SAFEGUARD THE PRINCIPLES OF FREEDOM, LIBERTY, AND JUSTICE FOR ALL; TO PROMOTE THE CAUSE OF PEACE AND GOODWILL AMONG NATIONS; TO MAINTAIN INVIOLATE THE FREEDOM OF OUR COUNTRY; TO PRESERVE THE FUNDAMENTALS OF DEMOCRACY; TO PERPETUTE THE FRIENDSHIP AND ASSOCIATIONS OF THESE VETERANS, AND TO DEDICATE OURSELVES TO THE CAUSE OF MUTUAL ASSISTANCE, THIS BY THE GRACE OF GOD.